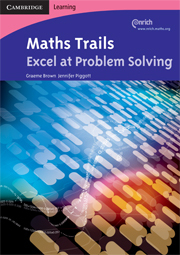 The Maths Trails teacher books and CD-ROMs introduce, develop and enhance mathematical problem-solving skills. 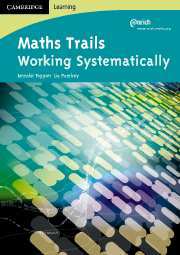 'Working Systematically' is part of a series of mathematics enrichment titles developed by the NRICH team at Cambridge University. This Teacher's Guide details 18 problem solving activities arranged in a trail progressing in difficulty. Each activity focusses on a specific skill or strategy that develops a particular aspect of problem solving. Full supporting notes for teachers include clear links to the curriculum, useful questions, prompts and hints for students and possible outcomes for each activity. Links to similar problems on the NRICH website are given and students are encouraged to post their solutions on the site. 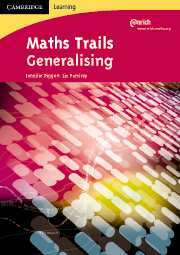 Maths Trails has a structured approach to problem solving for top primary and lower secondary pupils. You can choose from over 15 problem-solving activities on each trail helping pupils develop strategies and skills for problem solving. Each trail gives a progressive route to develop pupils’ mathematical thinking skills and encourage collaborative work and discussion. The teacher’s book includes links to the curriculum, planning suggestions, appropriate questions and prompts for lessons together with possible lesson outcomes and assessment for learning guidance. Maths Trails has been developed by members of the NRICH team at Cambridge University to complement resources on the NRICH website. To enable pupils to explore mathematical ideas and engage in mathematical discussions the CD-ROM links to the NRICH website for further similar problems and for pupils to post their solutions.